Joined by friend Beth Candy, Wonder Woman and her Lasso of Truth return to promote peace and fight evil. Internationally renowned comic book writer Grant Morrison has started work on a new Wonder Woman story. Despite being one of only three DC Comics characters that are continually in print, Wonder Woman has lost her lustre since her initial publication in 1941. 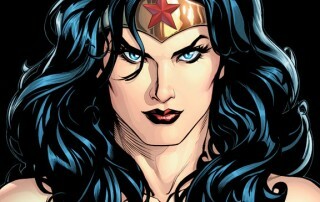 Living on the women-only Paradise Island, Wonder Woman is an Amazon warrior princess whose real name is Princess Diana. Often said to be stronger than Hercules and more beautiful than Aphrodite, her skills, strength and weapons were gifts from the Olympian gods. She has the requisite superhero strength and speed, plus a boomerang tiara, indestructible bracelets and a Golden Lasso of Truth, as well as the occasional use of an invisible plane. At the peak of her popularity, Wonder Woman appeared on the first cover of Ms. Magazine in 1972 and was the subject of a US television series that ran from 1975 to 1979. Since then, her story has languished as male superheroes began powering their way across the big screen. Fans of Wonder Woman hope that her life of obscurity may be about to change, thanks to Morrison. He is considered by many fans to be one of the world’s best comic writers, and in 2012 he was awarded an MBE for services to art and literature. His inspiration for the work-in-progress, titled Wonder Woman: The Trial of Diana Prince, came from the constant questioning of Wonder Woman’s value – from not selling enough copies to not being representative enough of various groups. ‘Beyond that,’ said Morrison, ‘women are always on trial. He says that his version of Wonder Woman contains ‘lots of different female relationships to show that there’s not just one type of woman and she’s not representative of all women. Which includes inspiration from singer-songwriter Beth Ditto. Artist Yanick Paquette is doing the artwork for the story, and at the time of writing, Morrison said that approximately 20 pages of the 120 page graphic novel were complete.